Electronic and traditional ballast for HPS and MH lamps. Ballast ELT 400 Watt with thermic security. Ballast ELT 600 Watt with thermic security. 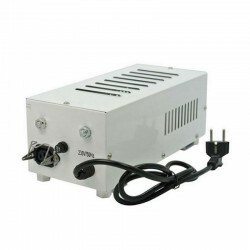 OptiLight Horti Gear HPS / MH 400 Watt: completely isolated ballast. Already pre-wired, no electrical installation to perform. OptiLight Horti Gear HPS / MH 600 Watt: completely isolated ballast. Already pre-wired, no electrical installation to perform. Lumatek digital ballasts are the most advanced lighting solution for modern horticulture. Compact gear for lampe HPS or MH. Flowering and growth bulbs HPS and MH need a ballast. These ballasts are suitable for all HPS and MH lampes. Lumatek has several advantages, is less hot, consumes less energy and gives more light.